When my mom and I were on our tour in Fátima, Portugal, I had to ask her about something that had bothered me since childhood. When she and my father got a divorce, our neighborhood church turned her away. I couldn’t understand this because my Mormon friends down the street had the support of the entire local Mormon congregation when their parents got a divorce. They brought over casseroles, babysat, and donated clothes and school supplies. By contrast, my mom, who had attended Catholic school and went to church every day, had nobody to help her. That’s the reason why I had resented the Catholic Church for most of my life. When I asked my mom about that period, she told me that it wasn’t the Catholic Church that wouldn’t welcome her but the priest at our parish. She also said he took donation money and sent it back to his hometown in Portugal after it had been hit by an earthquake. That’s when my mom, my two siblings, and I stopped going to mass. I didn’t care for that church anyway and never felt like going back after they turned mom away when she needed support. In college I learned about other religions in humanities courses and enjoyed hearing that all great religions have the same values—love, compassion, service to others, forgiveness, peace, and gratitude. Over the years, I’ve tried to embody those values in my own way, without following any organized religion. But as a child, I felt I was a bad Catholic. Catechism was a drag, and my first confession was the scariest thing. (There’s something terribly wrong about forcing innocent children to confess a sin.) I couldn’t think of anything to reveal, so I made up a white lie about pushing a boy in class. This was back in the mid-1970s. I hear they call it reconciliation now. Whatever the name, I hope it’s no longer scary for kids. I also barely made it through my first communion, when I was scolded by Father Joe for not holding my hands in prayer while I walked up to receive the host. The best thing about mass was seeing my Filipino friend Lisa. Our moms let us sit together in the back row. We couldn’t understand anything Father Joe said, so we would invent our own fun. You know those moments when you’re not supposed to laugh, but you cannot contain yourself? We got the giggles every time! When during communion Father Joe said “body of Christ” with his thick Portuguese accent, I always thought he’d said “bicycle ride.” Naturally, this sent me into daydreaming about riding my bike with Lisa after mass. But let’s go back to present day Fátima. Mom went on to tell me that she never lost faith in God. She kept praying, and she said she couldn’t have survived the divorce without her faith. On our trip, I saw her whisper her prayers every night before she went to bed. It was cute. It was also very moving for me to see this before I walked my Camino. While on it, I went into a lot of churches, attended some services, and prayed a lot for everyone in the family. I didn’t think the Camino would get me closer to God or renew my faith, but it did. I believe that people can find God everywhere, whether it’s in nature, churches, temples, synagogues, meditation centers, yoga studios, or prisons. A house of worship isn’t a necessity for one to pray. As my mom says, “You can talk to God anywhere.” However, since my return from the Camino, I’ve gone to almost every Sunday service at a church that Pam, my mother-in-law, likes to go to when she visits. I feel welcome there, and I like the sense of community it offers. The congregation there is progressive and gives support to those in need. Once, when Pam and I heard a priest talk about the death of a longtime parishioner who was gay and whose partner had sat across the aisle for years, we wept. The Catholic Church may have its faults, but it has surely come a long way. 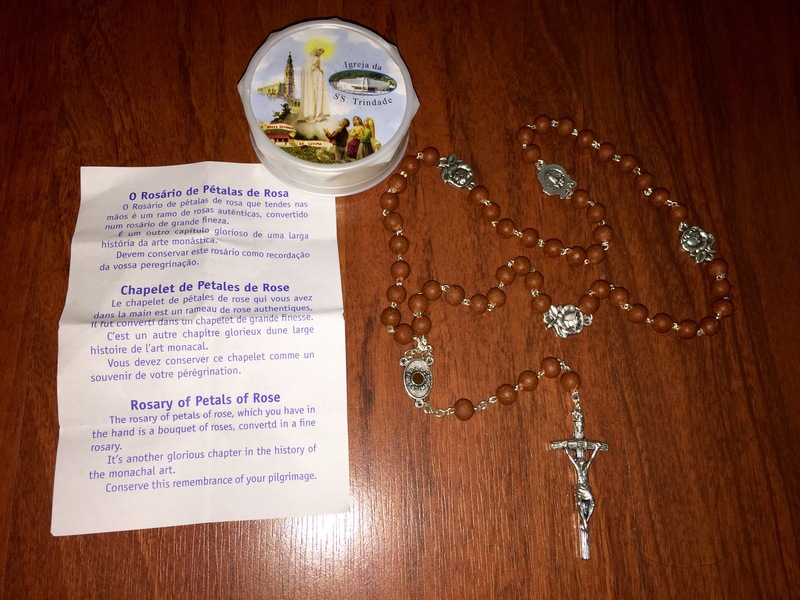 My mom and I bought rose scented rosaries in Fátima (see photo above). I brought mine out and said prayers with it in every church I went to on the Camino. I also use it in my new church here, in Oakland, during the Sunday service. 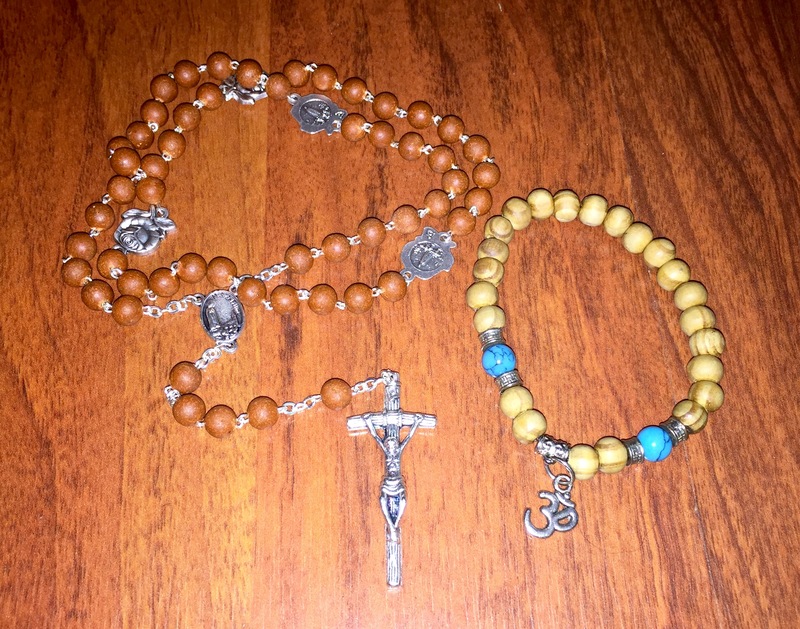 I have it with me at all times along with my sandalwood mala bead bracelet with an Om symbol charm. Both are now symbols of my faith. I see houses of worship differently now—I started appreciating them. And instead of giggling in church, I now get teary-eyed. 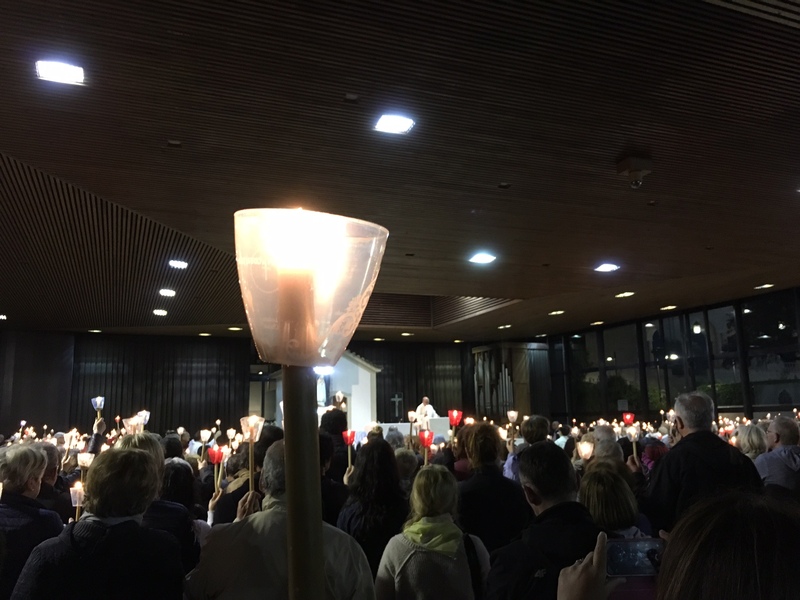 The candlelight service in Fátima reminded me of our shared hope for peace. The flame has been rekindled. 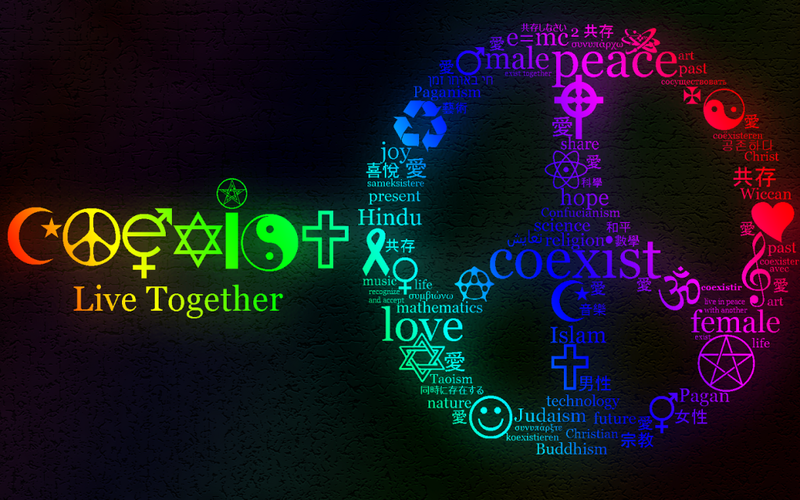 I have faith in humanity, as long as we can coexist. Thanks Mary! Glad you had a similar positive experience too. Did you write about it in your book? I could talk to you all day about my own volatile relationship to the Church over the years. I’m not Catholic, but rather a product of the Bible-Belt South and my beliefs are probably considered backward and old-fashioned by most. I’m okay with it, but it’s an odd feeling to be part of a rapidly shrinking (or growing depending on how you view it) minority. I went to the Camino with expectations that it might somehow change me in a deeper, more spiritual way. In retrospect, I don’t think it changed me at all, but rather brought me further down the path I was already on. Steve, thanks for your comments. The Camino works in mysterious ways. Correction. God works in mysterious ways! 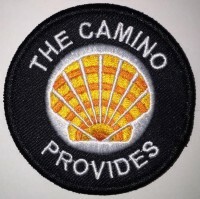 The Camino brought me back to God. Laurie, truly touched by your Camino experience. You know how much I love you and your Mom and reading this entry since I do practice Catholic faith it send a sense of deeper connection to you regardless of what church you visit. I think everyone experiences some of the same as you did as a child yet wow what a journey. You are filled with love and it resonates with smiles and joy just by being around you. I feel blessed knowing you. Will be on Camino Oct 1 thru 7 on a much shorter version but in true spirit. Thanks for the inspiration. Thanks for your kind words. I’m excited for you going on the Camino in October! Is Faye going with you? A short Camino is still a good Camino. 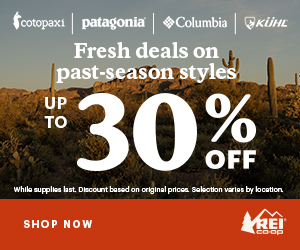 Let me know if I can help in any way. I appreciated reading your experiences and thoughts, and those of everyone else in responses. Your story is powerfully written straight from your heart. I’m so glad we shared hospitalario training. I recognized an angel aura glow that surrounds you when we first met. When you spoke before the class, I felt Spirit affirmed our heart to heart connection. Thank you for sharing the story of your mother and your return to faith. Your story helps me release a burden I’ve carried since 1972. In 1972, my 15 year old sister Patty was run over and killed in front of my mother. I was 16, eleven months older; Patty was my closest friend. Afterwards, with mom screaming for me to tell her why God killed Patty, I called the priest and he came to our house. When the priest said God ‘took my sister’ to pay for my mother’s sins of being divorced and taking birth control pills, I threw him out the front door. Learning to forgive that Priest, the ‘official’ Catholic church, and most of all myself for not being there to protect my sister was part of the healing of my first Camino pilgrimage that I’m currently writing about. Writing is hard with my head and spinal injuries but you’ve inspired me. One day, I want to be the writer that you already are. Wow, Tina! What a tragic yet incredible story. My heart goes out to you and your family. I felt the connection with you in the training as well and I am so glad to know you. It would be an honor to serve as a hospitalera with you. 🙂 Please keep writing. It is therapeutic! Just like the Camino is healing.